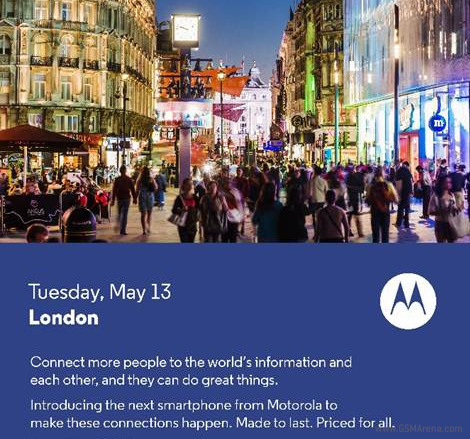 We just received Motorola's invitation for a special smartphone announcement on May 13. The event will take place in London, two weeks from now, at 8:45 AM local time. There isn't any other information on the device besides "Made to last. Priced for all", so we'll know more on May 13. There are currently two Moto handsets in the rumorland - the Moto E and Moto X+1. The invitation text clearly suggest this will be a smartphone event, but we still hope to see more of the upcoming Moto 360 smartwatch too. You bet we'll be on spot and we'll cover the press event as it unfolds. Stay tuned!